This is a tough but rewarding walk. The pretty resort of Lyme Regis is the starting point for this walk which has lots of places to get refreshment and a good sand and shingle beach. 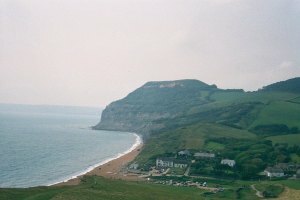 From Lyme Regis the walk goes to the small village of Charmouth, past some of the famous Jurassic Cliffs. 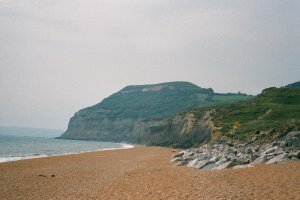 There are two routes which can be taken between Lyme Regis and Charmouth, along the beach or over the cliff, depending on the tide. From Charmouth the walk goes over the famous Golden Cap, the highest cliff on the coast path, and in fact the highest in southern England. The views from the top are stunning, but it is quite a climb to get there. 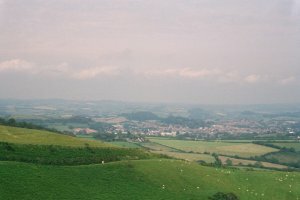 From Golden Cap there is a descent down to the pretty village of Seatown. 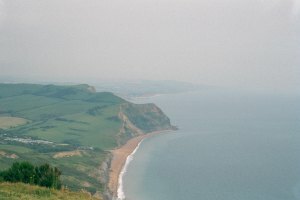 From Seatown there is another smaller climb before descending into West Bay. From West Bay there is a flat path into the centre of Bridport. 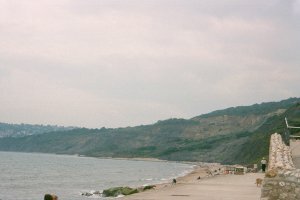 Lyme Regis is best accessed from the main A35 from where the B3165 descends into Lyme Regis. The road down into Lyme Regis is very steep though. 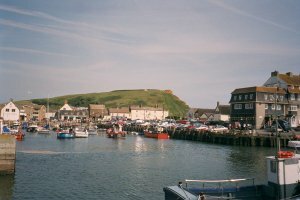 There is plenty of parking near the Cobb at the west end of the town, or some other car parks near the shops. By public transport there is an hourly bus service from Axminster (including the station), Bridport, Dorchester and Weymouth. It is timed to connect with most trains at Axminster and Dorchester South stations. Axminster station is on the West of England line, with services from Plymouth, Torbay, Exeter, Honiton, Yeovil, Gillingham, Salisbury, Basingstoke, Woking and London. Dorchester South is on the south west main line with services From Weymouth, Wareham, Poole, Bournemouth, Brockenhurst, Southampton, Winchester, Basingstoke, Woking and London. Through rail and bus tickets are available via both Axminster and Dorchester South. The bus is number 31, operated by First Southern National, for more information call 01823 272033. 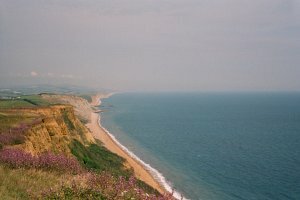 There is also a bus service which runs along the coast from Exeter to Weymouth, which stops at Lyme Regis, Charmouth, West Bay and Bridport. There are four through journeys Monday - Saturday between Exeter and Weymouth, one service between Bridport and Exeter (not calling at West Bay), and one between Weymouth and Bridport. The service is number X53, operated by First Southern National. For more information on this service call 0870 608 2608. There is a good choice of accommodation in Lyme Regis. There is a tourist information centre in the town which will be able to help with booking accommodation. 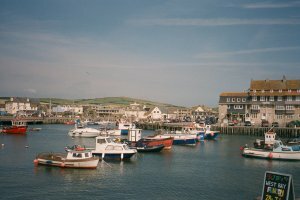 West Bay and nearby Bridport also offer a good range of accommodation, and again has a tourist information centre which can help you book a Hotel. I started this walk from the sea front in Lyme Regis. 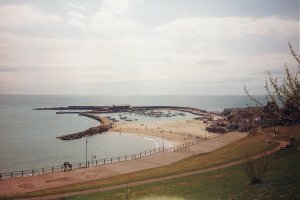 Lyme Regis is a pleasant resort, with a good range of restaurants and cafes along the sea front, and the famous Cobb. When I did this walk, there was a Jazz festival on the Cobb, which was drawing quite a crowd. 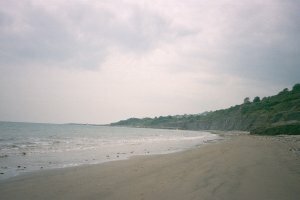 The beach at Lyme Regis is a mixture of sand and shingle, with the Cobb being sandy, but most of the other beaches are shingle at high tide, with soft sand at low tide. 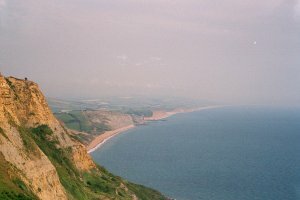 The cliffs beyond, towards Golden Cap make a spectacular (if daunting) sight. 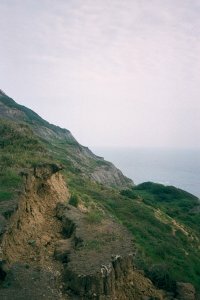 Cliff eroision and land slips have meant the route out of Lyme Regis is now very poor. Follow the A3052 main road from the Cobb, Church Street up hill. After the car park and football ground fork right on a path that joins a track , Timber Hill, Follow this to the road and turn right (north along the road). Join the A3052 briefly and then take the signed path over the golf course. Go over Fern Hill and re-join the A3052 turning right. At the roundabout with the A35 take the road into Charmouth and follow the diversion to the sea front. 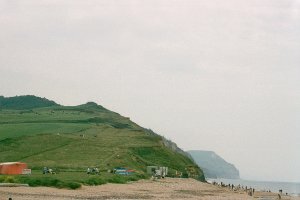 Although a footpath is marked on maps along the back of the beach between Charmouth and Lyme Regis the route has been obstructed by a landslip. This was meant to be a temporary problem originally but Dorset County Council is poor at maintaining paths and the coastal route doesn't look like to be re-instated in the near future. It is sometimes possible at low tide to follow the beach all the way round to Charmouth however this is NOT recommended because the beach is often blocked by landslips, there is a danger of being cut off by the tide and a danger of rock falls. This part of the coast is a World Heritage site, and this area in particular, is well known for fossils. I was amazed at how many were visible, in places every rocks seems to have a fossil in it. There are often fossil hunters out on this part of the beach. There is a small stream pouring onto the beach, creating a soft clay stream. It looks like sand, but is not and your feet will sink if you try and walk on it (I speak from experience! ), so try to climb over on the rocks. The area is obvious because a lot of it washes into the sea so makes the sea a more yellow colour. There are other areas with this soft clay on the beach, so take care. Some of the rocks are also very crumbly and can give way underfoot. There have been a large number of cliff falls here recently, so you'd be well advised to avoid walking close to the cliffs where possible. Charmouth is a pleasant small town, where you can get refreshments. The coast path though Charmouth is currently diverted however. The diversion is very well signed though (including a small map). You need to walk inland through mostly quiet residential streets, until you get to the road bridge across the river Char. There is a pavement, and once across the bridge, take the smaller road to the right (it is well signed) up Stonebarrow hill. Do not be tempted to take the footpath on the right hand side of the river Char in Charmouth. This is obstructed and has been for years (since at least 2007) but Dorset County Council does not do anything about it. It is quite a steep climb up the road in places, and there isn't much view of the coast. There are pleasant views of the nearby farmland though. When the road reaches a National Trust car park, the diversion is signed to rejoin the official coast path route, past Westhay Farm. 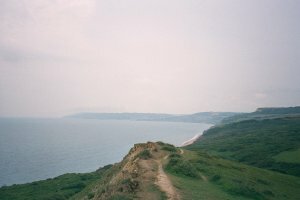 The coast path then drops towards St Gabriels Mouth, before the steep climb to Golden Cap. The climb to Golden Cap is very steep in places and very hard going. Towards the summit, the path begins to zig-zag which makes this part of the climb slightly less steep. The views from the top are superb however. On a clear day, you can see Portland to the East and towards Start Point in the west. The cliffs around here are spectacular. Enjoy the views from top, before starting the steep descent back down the other side. Again, this is very steep, and can get slippery after rain. Once at the bottom, you'll reach the small village of Seatown. 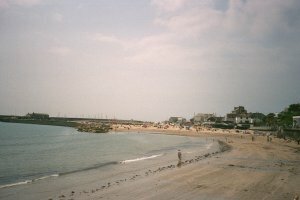 Seatown is a pretty place and has a very good clean shingle beach, which provides a good resting point. There is a good pub near the seafront and a small shop where you can get refreshment. 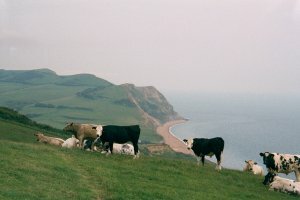 From Seatown, there is another steep climb towards Thorncombe Beacon, through some fields of cattle. Again, the view from here is excellent, and gives good views of Golden Cap to the west. 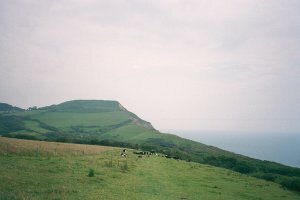 The descent towards Lower Eype is also steep. 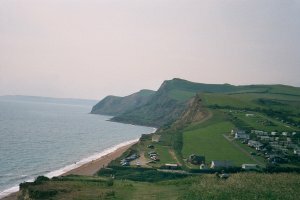 From Lower Eype, it is a more gentle walk into West Bay. 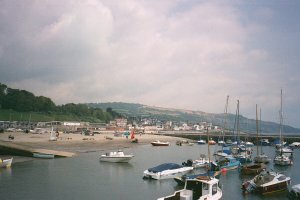 West Bay has a pleasant harbour and a small shingle beach. Unfortunately, there is quite a lot of construction work going on near the sea, so it is not as pretty as it could be. There are buses back from West Bay to Lyme Regis, and a few into Bridport. If there is a long wait though, it is a short (and flat) walk into Bridport town centre, from where there are frequent buses. The footpath starts in the Caravan site off the roundabout by the harbour, although there are no signs. I get the feeling the owners of the Caravan site are not keen on this path, since it is not at all well signed. Keep the river to the right, and follow the path through the site. At the back of the site, there is a gate leading to the footpath. This goes through some fields and under the A35. Stick with the path until a small bridge over the road, take this (signed for Bridport Town Centre). The buses depart from the high street. Since they go via Charmouth, the journey is quite slow, but also quite scenic. The buses stop at the bottom of the main street in Lyme Regis, at the bottom near the beach. There are services running around every 3 hours from West Bay back to Lyme Regis. This service is X53 run by First Southern National between Weymouth and Exeter. 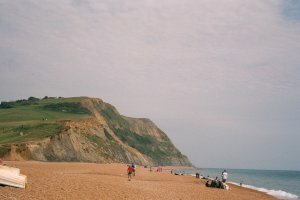 There are no other buses between West Bay and Lyme Regis, so the alternative if there is a long wait is to either catch a bus inland to West Bay (these are not very frequent), or to walk to Bridport. The walk to Bridport is short and flat. From Bridport buses run hourly (every 2 hours on Sunday) to Lyme Regis, the number is 31 again operated by First Southern National. This service also calls Dorchester South and Axminster rail stations for those traveling on by train. Ordnance Survey Landranger map 193 covers this area of the coast path and is available from most book shops nationwide. It is also stocked in some shops in Lyme Regis. 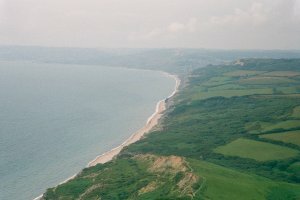 Multimap is a web site which provides maps of the UK, including around around Lyme Regis and West Bay. 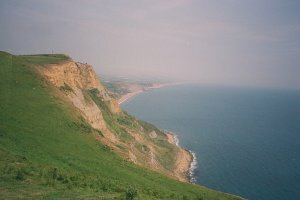 The links below will be of most use to the coast path from Lyme Regis to West Bay and Bridport. 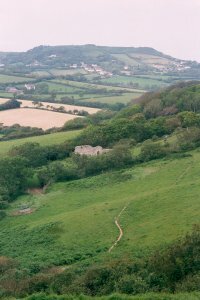 These maps join to provide the complete coast path between the two points.